Everyone keeps talking about how the Vikings are going to keep the players on the team due to cap space. Well let's look at that. In 2018 there are 4 teams (Niners, Lions, Saint and Falcons) that are paying out more in cap space for QB's than the Vikings. In 2019 that goes to two, the Saints and the Cardinals, with the Lions only 100k behind the Vikings. Now in 2020, the last year of Cousins deal, the Lions will still be paying more for QB's. However, the Saints will lose Brees, the Falcons will have to extend Ryan. The Packer will have to pay Rodgers. The Rams Goff. Right now their are 11 teams that have zero cap space allotted to QB's in 2020. Think about that. 1/3 of the NFL has no QB signed for 2020. None of them have QB's signed for 2020. The following have less than $1.3 million allocated for QB's in 2020. So, while everyone is talking how Cousins contract is going to have an impact on who the Vikings keep, I think they should be looking at some of these other teams and asking the same question. Re: QB's and cap space. I don't think this will make signing our guys any easier but it does show why there is parity in the NFL and why it is hard to stay dominant for long stretches of time. Raptorman wrote: Everyone keeps talking about how the Vikings are going to keep the players on the team due to cap space. Well let's look at that. In 2018 there are 4 teams (Niners, Lions, Saint and Falcons) that are paying out more in cap space for QB's than the Vikings. In 2019 that goes to two, the Saints and the Cardinals, with the Lions only 100k behind the Vikings. Now in 2020, the last year of Cousins deal, the Lions will still be paying more for QB's. However, the Saints will lose Brees, the Falcons will have to extend Ryan. The Packer will have to pay Rodgers. The Rams Goff. Right now their are 11 teams that have zero cap space allotted to QB's in 2020. Think about that. 1/3 of the NFL has no QB signed for 2020. Those other teams have other players that will be coming off the books. None of this affects our team, one of the most talented in the league, keep our players. I am happy to have Kirk. I am unhappy to lose Barr, Hunter or Diggs. We can lose Waynes. Waynes may be the hardest to replace though. I dont think he is the best player of the bunch, but he has learned his position well. And I think CB is the hardest position to learn. Waynes has natural instincts when it comes to run stopping and run support, even taking on blockers. He is now in a position to learn more coverage skills. As much as I like Barr, and think he has the highest ceiling of anyone, I believe he will be cut. We cant lose Hunter and certainly not our hero, Diggs. We knew this would happen, it happens to other teams all the time. From Nick Olsen. A way to keep everyone, under the cap. If he can do it, I'm sure the Vikings are smart enough. The Vikings can do it, I think it's more a question of do they want to basically kill their flexibility. If all these guys get re-signed that more or less means no major FA's next year. Also there are a lot of guys on 1-year deals (Richardson, Wright, Easton, Murray, Sherels, and numerous depth players). Not to mention Thielen is underpaid. They can restructure a few guys to ease the cap up a bit but there's definitely going to be some tough decisions coming up. S197 wrote: The Vikings can do it, I think it's more a question of do they want to basically kill their flexibility. If all these guys get re-signed that more or less means no major FA's next year. Also there are a lot of guys on 1-year deals (Richardson, Wright, Easton, Murray, Sherels, and numerous depth players). Not to mention Thielen is underpaid. They can restructure a few guys to ease the cap up a bit but there's definitely going to be some tough decisions coming up. Guys who will be coming up on third deals are the most likely to be sacrificed if they don't want to lose any of the young guys. 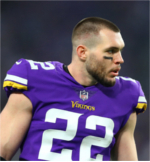 The Vikings have been able to get those guys to restructure and keep some leadership in the past, hopefully they can pull that off with guys like Griffen and Rudolph, and Sendejo or perhaps even Kirk Cousins! The vikings could rework his contract if they do an extension and create more cap room that way in the next year or two. Richardson is an interesting case, but I think Wright, Easton, Murray and Sherels are pretty easily sacrificed if that's what it takes to get the cap space to keep a player like Diggs or Barr. Griffen and Rudolph are probably the most likely restructure targets. They could structure a signing bonus to spread out the cap. Diggs or Barr against one of those players individually is a no brainer but it may be most of them. That includes a starting guard, one of the best returners in football, our committee RB, plus backups. Brez has been pretty magical with managing the salary cap and I'm far from an expert, so hopefully we get it done but it will be tight. I agree it would have to be most/all of those guys to get close to the salary of a premier player. The biggest loss could be Easton, depending on how near his ceiling he is. I love Sherels of course, but the other guys are rent-a-players.